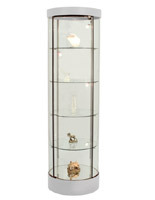 These round tower display cases lend a calm, natural tone to shops, lobby areas, museums and academic hallways. What advantage does their design have? Their curved surface makes for an alluring showcase in open floor settings. 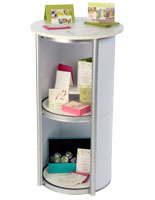 These round tower display cases, like our other curio cabinets, include wheels, halogen top lights, optional track lights along the sides, a glass mirrored deck, locking glass door and a tempered glass frame. Available are contemporary or conventional wall showcases with a black, silver, maple or cherry laminate trim. Each curio cabinet has four shelves and a bottom deck for a total of five storage areas. 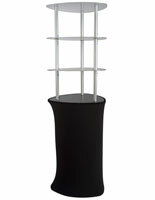 Where can these round tower display cases be used? Their narrow circular design is optimal for shops that require floor space. Each cabinet has four glass shelves for holding personal collections for in-home showcases. Their circular, full view design is alluring to visitors in museums and galleries. Schools can use the showcases to feature trophies, awards and creative projects. 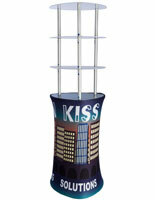 Round tower display cases have a 22" diameter and are great for locations with a floor space budget. 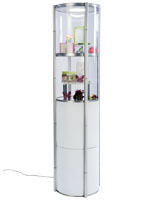 With their clear tempered glass construction, they can merchandise goods against a wall or in the center of a room. 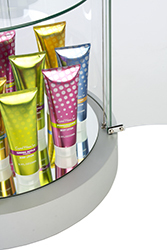 These showcases feature a locking door that will keep valuables safe from theft and tampering. Their swing-open door is entirely transparent and hard to notice, keeping onlookers focused on their contents. While all models include top lighting, some feature side lights that will illuminate display items from an angle. These can be adjusted to tilt or move vertically to meet any user's needs. These lights can easy be switched on or off with the switch on the electrical cord. Each display case's mirror deck adds an extra element of attraction and makes it easy to see all sides of a displayed antique.